I love the way genres are constantly growing and mutating. Just a few weeks ago I’d contended that Super Meat Boy and its ilk ought to be called Precision Platformers. 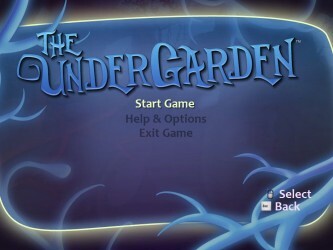 Now I find myself playing with The Undergarden, a so called Zen Puzzler soon to be available on multiple platforms from Artech Studios, and Vitamin G. These are the same folks who produced Aces of Galaxy, a frantic space shooter that is anything but zen. It will be interesting to see how they handle the opposite end of the spectrum in a niche genre. 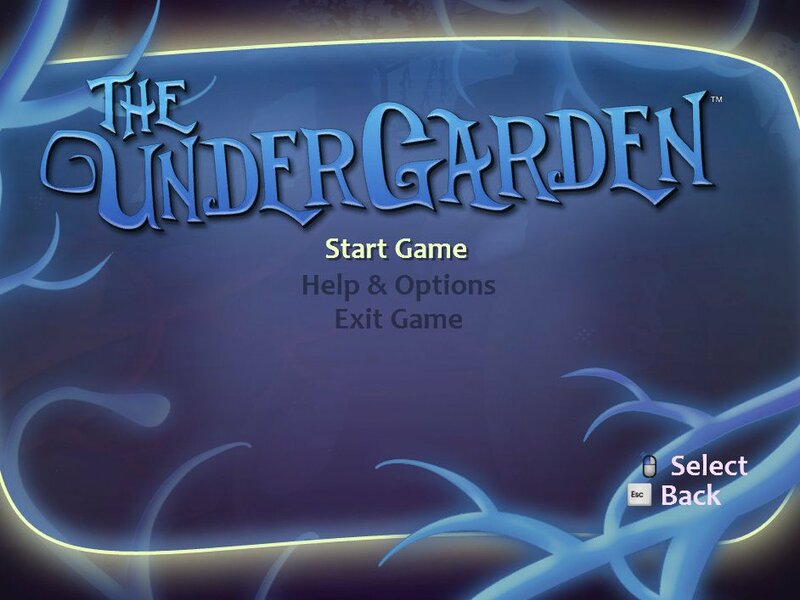 From the first glance, The Undergarden clearly has a very strong focus on visuals. The setting is a subterranean cave that begins fairly bland and muted. This changes quickly. Through the gameplay mechanics we’ll get into in the next section, you quickly bring the cave blossoming to life. If you do your job correctly, you’ll leave each cave utterly bursting with psychedelic yellows and reds and violets, like a cross between a black light poster and an aquarium. There is an unmistakable sense of life to it as well, as the flowers swell up in a wave behind your character, blossoming with their own twisting animations. Though words like “pollen” and “flower” are tossed around, everything seems more like a luminescent cross between plant and animal, the sort of thing you’d see in a deep sea trench. Your character is cute, a sort of pudgy gremlin creature. 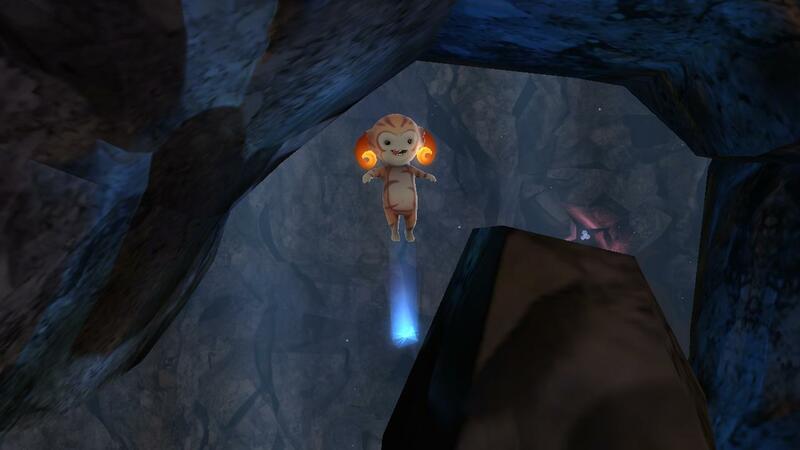 Before long you’ll start unlocking costumes that take the cuteness to sickening levels. After spending a few hours helping a cherubic imp with blue green skin, blue horns, and a top hat drift around causing flowers to bloom, I felt like I should go wrestle a bear or something in order to restore some masculinity. Rounding out the visuals are the little details. 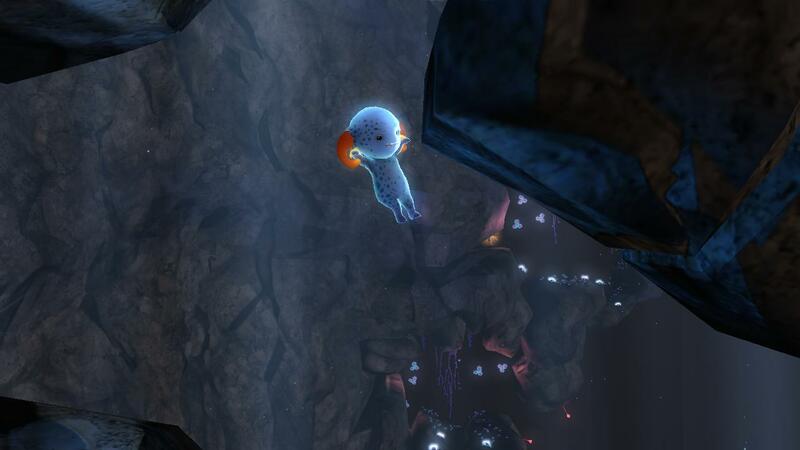 The background of the level shows other portions of the level, complete with their drifting hazards and waiting puzzles. The HUD is simple but informative, letting you know your progress through the level, your pollen levels, and the total amount of foliage you’ve managed to bloom without a single word or number. There are “musicians” who produce little floating clefts and flats, and dragging them around with you causes sweeps of color and motion. The game is a visual treat, all around. The gameplay is fairly unique, but it seems to draw inspiration from a number of sources. 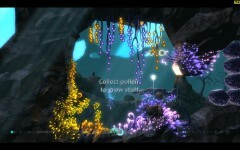 The main mechanic centers around causing the dormant plants to bloom. 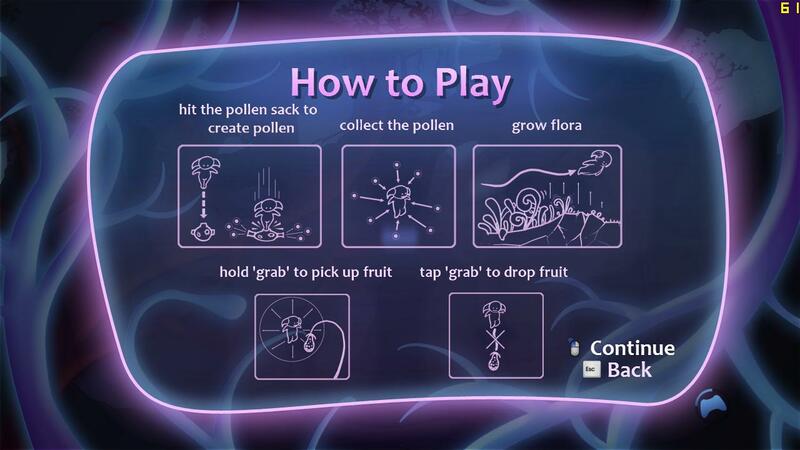 You achieve this in a way similar to the other significant game in the “make plants bloom” genre, Flower. Basically, you drift slowly around, causing any plants you approach to burst to life. Unlike Flower, however, in order for your creature to bring plants to life, it needs to load up on pollen via green pods that are scattered through out the area. You can only carry a limited amount of pollen, so periodically you’ll need to recharge. Among the various flora and fauna are assorted types of fruit trees. 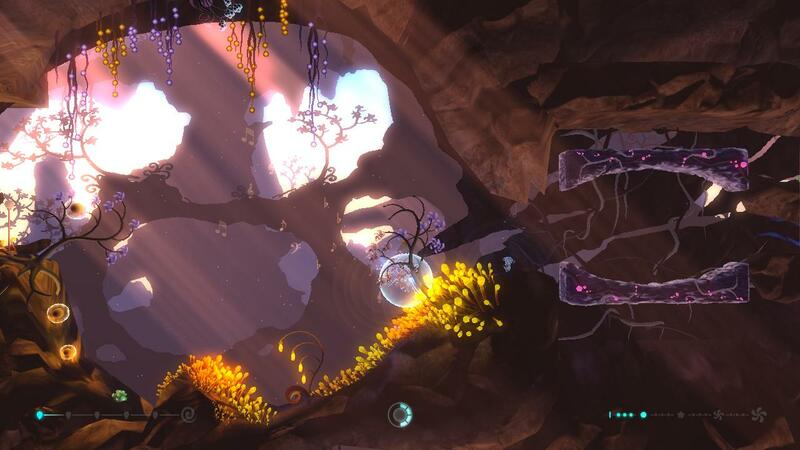 These trees and their distinctive fruits drive the other main gameplay feature, the physics puzzles. Initially the puzzles are simple. Heavy fruits push things down, buoyant fruits push things up. As the game progresses you’ll find more and more varieties of fruit that allow deeper puzzles. Glowing fruit banishes areas clogged with darkness. Bomb Fruits send objects flying and shatter weak rock. 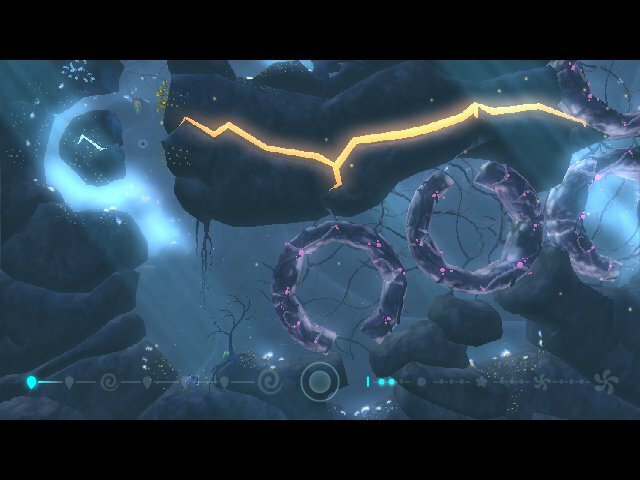 Electric fruit activates moving sections of the level. By the end of the game, the puzzles can get pretty complex, but they are seldom overly challenging, smoothly leading you to their solutions. There are “enemies”, objects that sap away your pollen and cause you to drop anything you’ve grabbed, but as far as I can tell there is no way to actually die. 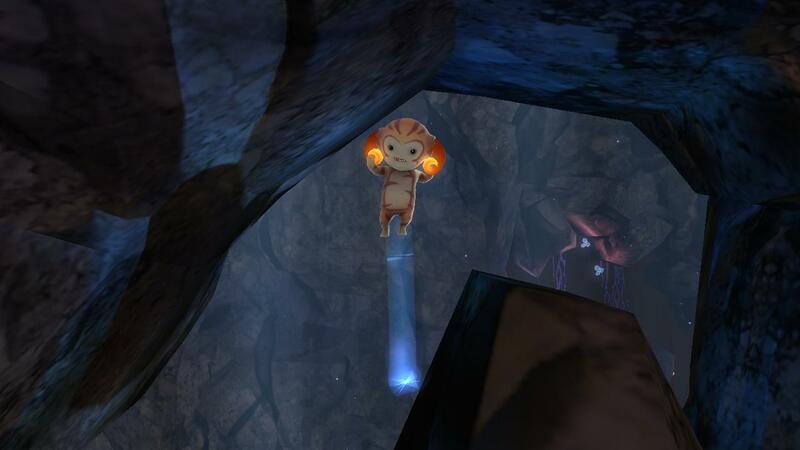 All they do is add a little bit of timing and obstacle avoidance into the puzzle solving. For the PC, there are two control options. Either Mouse and Keyboard, or Controller. The Xbox 360 controller works just fine by default, and I highly recommend it. Coaxing the character around with the mouse pointer, while perfectly in line with the gentle and serene setting of the game, can be frustratingly slow and imprecise. The controller, or at least the arrow keys, give you a much firmer grip. Aside from the drifting, deep sea movement that makes this game so mellow and slow pace, your character has a few more simple moves. By holding down a “grab” button, you conjure up a sphere that links everything it touches to you, allowing you to gather and transport fruit and “musicians”. Another tap drops everything. Carrying objects effects your little guy’s speed and momentum, whether it is the floating fruit dragging you up or the heavy fruit dragging you down. On those occasions when you need a little more speed or a little more oomph, you are given a boost button that will let you charge up and fling your little guy. It is very handy for getting him unstuck when lodged, and for muscling around huge clusters of fruit. In order to build replay value, every level has a number of hidden collectibles, namely at least one gem and a handful of “secret flowers”. Often, these collectibles are hidden behind puzzles that are much more difficult than anything you would have to do to complete the level. Other times they are simply tucked away in an easy to miss corner. Every level assigns a score based on things like how many collectibles you snagged and what percentage of flowers you bloomed. There are a few things that could have made the game a little friendlier. Getting fruit to land in the designated “cups” of stone could get a bit finicky, so a magnetic-style attraction to guide them in would have been a good addition, but other than that, it is solid. Taken as a whole, the game is practically a sedative. If you really buckled down and sped through it, you could probably reach the end in four or five hours, but that is not at all how it is intended to be played. It is about the journey, not the destination. The audio is well matched to the gameplay and visuals. It is an understated, mellow soundtrack, a musical counterpart to this mental massage of a game. It is coupled with subtle audio cues that let you know that you’ve successfully locked on to fruit and the like. Anything more would have been distracting. As is so often the case with games of this type, the story is largely left to the player, it seems. There are little cryptic snips of text on the load screens, but most are focused upon providing gameplay hints. I choose to believe that you are playing as a tiny supernatural gardener with the most sadistic clients ever. The Undergarden is a relaxing break from the hair-pulling tests of skill that we’ve been reviewing of late. It is slow, methodical, and tranquil; so much so that after a few minutes of tracing along the edges and watching plants blossom, running into a physics puzzle seems almost out of place, like being given Nyquil and then being asked to do a crossword. 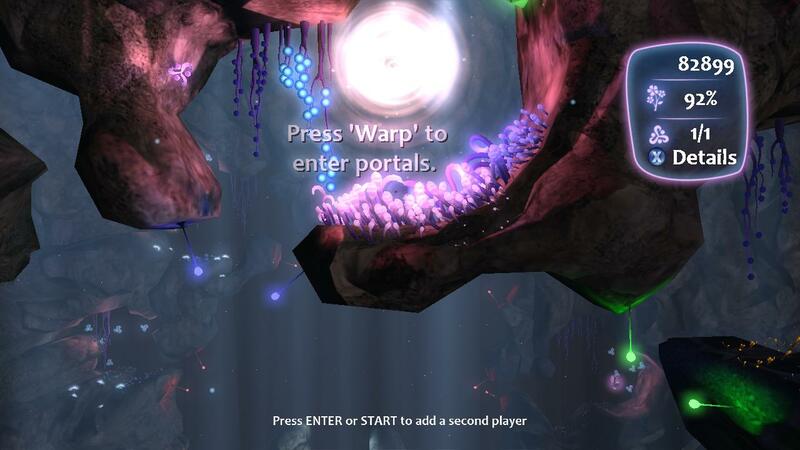 I’m all for making a 2D version of Flower, but physics puzzles were an unexpected twist. It is like peanut butter and bacon; not an obvious combo, but surprisingly good. The difficulty is never enough to disrupt the relaxation, making this the perfect game to unwind after a stressful day. And with plenty of levels and local co-op, it is a good value to boot. 7.7 / 10. A soothing, visually appealing game for the casual puzzle solver.